PEPLUM star Umberto Silvestri, who appeared in ULYSSES, THE QUEEN OF SHEBA, SPARTACO - SINS OF ROME, COLOSSUS OF THE ARENA and countless other PEPLUM films, can be seen in the entire galley moment in BEN-HUR. 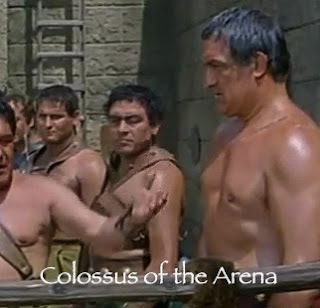 I included a screenshot of Umberto from COLOSSUS OF THE ARENA just for comparison. He's not listed in the BEN-HUR credits, either in the film or at IMDb. I've already posted about this strong fellow here at the blog: link. It was cool when I noticed him as I watched BEN-HUR again. I think there are several actors from PEPLUM films in BEN-HUR. Since it was filmed in Italy. Another film which has top PEP Stars in it is 55 DAYS AT PEKING. Which was filmed in Spain. I have a question for you: Do you have an idea of how many PEPLUM films were made during 50's and 60's? I have many, but have read that the Italians made at least 130 or more. I have over a thousand films in my collection so I wouldn't know where to start to count how many PEPLUM films they made in Italy. There are other PEPLUM actors in BEN-HUR but they have been, for the most part, identified and credited at IMDb. Umberto is not credited anywhere so this post is the first mention of him being in BEN-HUR anywhere. I would like to thank you for your deep research and for knowing my grandfather's work so well. my cousin and weren't sure what exactly grandpa did in Ben Hur and other films and found it thanks to you.